Since the last publication of the Ernst and Young book on Tandem security in the early 90's, there has been no such book on the subject. We've taken on the task of supplying a new Handbook whose content provides current, generic information about securing HP NonStop servers. Emphasis is placed on explaining security risks and best practices relevant to NonStop environments, and how to deploy native security tools (Guardian and Safeguard). All third party vendors who supply security solutions relevant to NonStop servers are listed, along with contact information for each vendor. The Handbook is a source for critical information to NonStop professionals and NonStop security administrators in particular. However, it is written in such a way as to also be extremely useful to readers new to the NonStop platform and to information security. 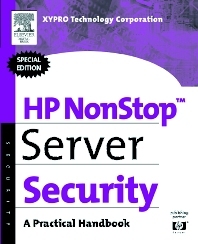 This handbook familiarizes auditors and those responsible for security configuration and monitoring with the aspects of the HP NonStop server operating system that make the NonStop Server unique, the security risks these aspects create, and the best ways to mitigate these risks. Security administrators dealing with any new or existing HP NonStop Server installation. "After reviewing this book, I would heartily recommend it as a 'must read' for any person serious about security on their HP NonStop servers!!!!!" Mark Chapman, HP NonStop Accredited Systems Engineer "This is an impressive volume on security. If a reader picks only one area to view, I believe Part 7 should be required reading for anyone running an application on HP NonStop servers. It goes into detail with good explanations for the security of source code, objects, and files. It is obvious that the team who created this reference guide is expert in this subject matter." Victoria Holmes, Vice President, Infrastructure Software, EPIQ Systems, Inc.